You don't have to buy them from these guys, they just had a good pic. Hilarious. I used to be a jag guy...and I think I have a set of those mounts in my parts hoard but never thought of them. I'm happy with the leaf spring eye mount style mount, but not the 90A Shore hardness. I can pour polyurethane and use the existing mounts to make a mold. It'll be fine. I could come forward with the pan. At this point, I'm down about 1/2 L to a litre so my guess is that the pan as it sits will still hold about 5 L - I'm fine with that. With the oil cooler, it's plenty of volume. 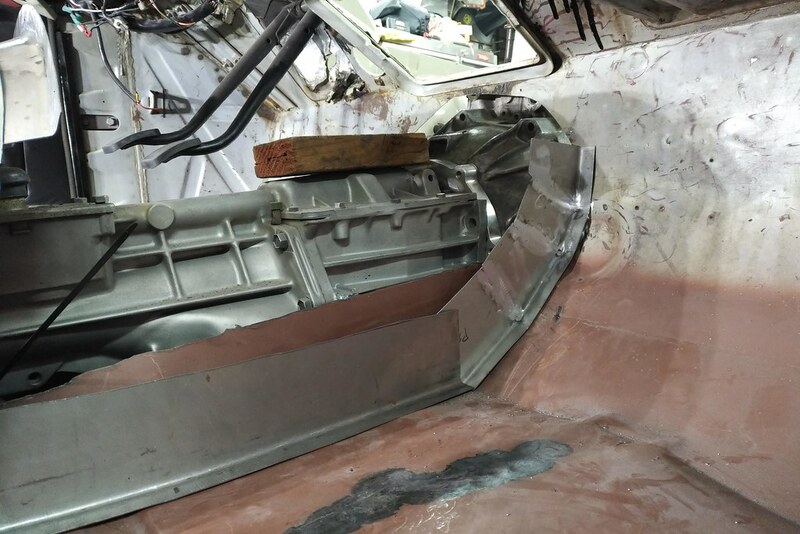 I will add some trap doors to the sheet metal baffle to further assist in corners to prevent oil starvation. If you're gonna be thrashing around on track days an oil accumulator is a good idea. You know how they work, don'tcha professor? I'm OK with the mount at this point. I can change it later if needed. Yup - fully up to speed on accumulator's. It's a good idea and simple to implement. Really no good reason to not have one. As far as track days...well, that's the idea - but of course this is Western Canada so my options are super limited. Southern Alberta has no tracks at this time so I autocross. Now, that said, I'm willing to head on down to the PNW and join you guys for a run or two. I mean...if there's still good coffee and beer. Until little donny puts a tariff on coffee (covfefe) we'll have plenty of that and lots of local micro brews!! See ya' next spring (fingers crossed)! The latest episode is now up. This time - engine mounts. 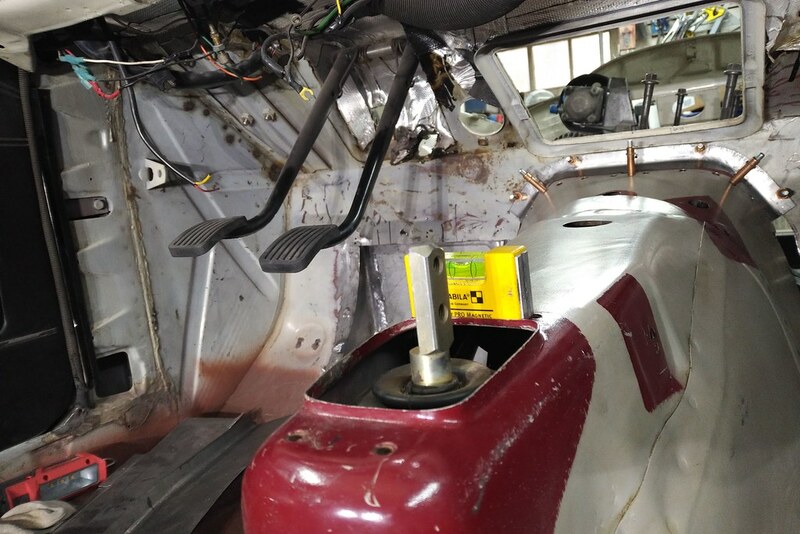 Rolling along - Anti Roll Bar video. Trying to get a few jobs cleaned up. 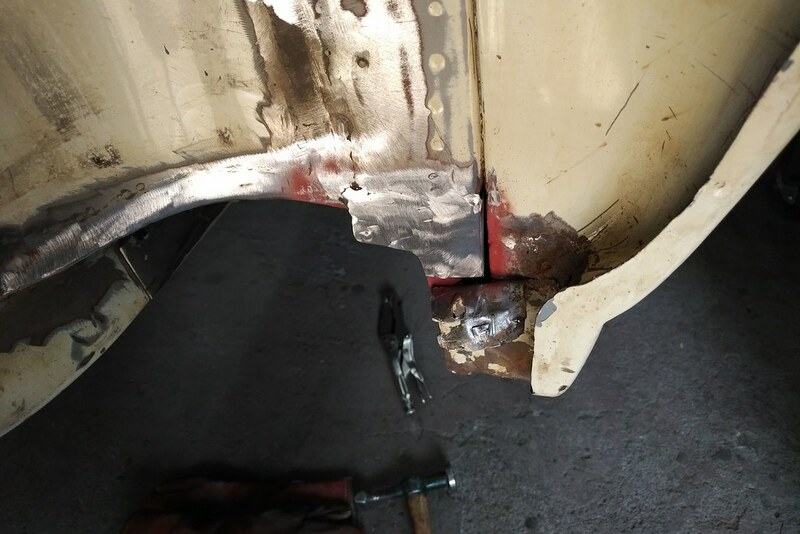 Thought I'd start with finishing the rear end sheet metal. I honestly need a break from some things and I enjoy sheet metal work. 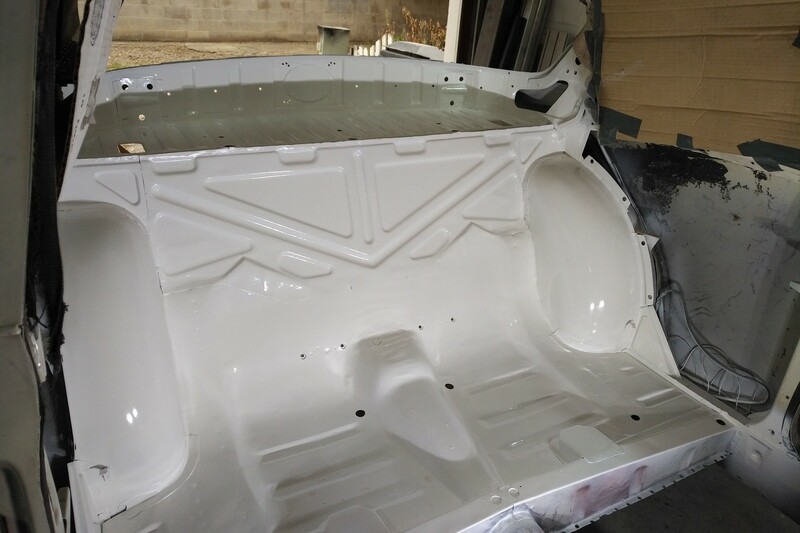 The weather is nice and I can get the priming done to at least hold things until we're ready to roll on the entire car. But just like everything - I get started and find a little rust. It didn't take long to fix - but it did pull me off other tasks for a bit. I'll fill you in later on the rest when it's all done. In the mean time - rust repair 101. Cut out the old stuff - use whatever is fast (air chisel was my weapon of choice). 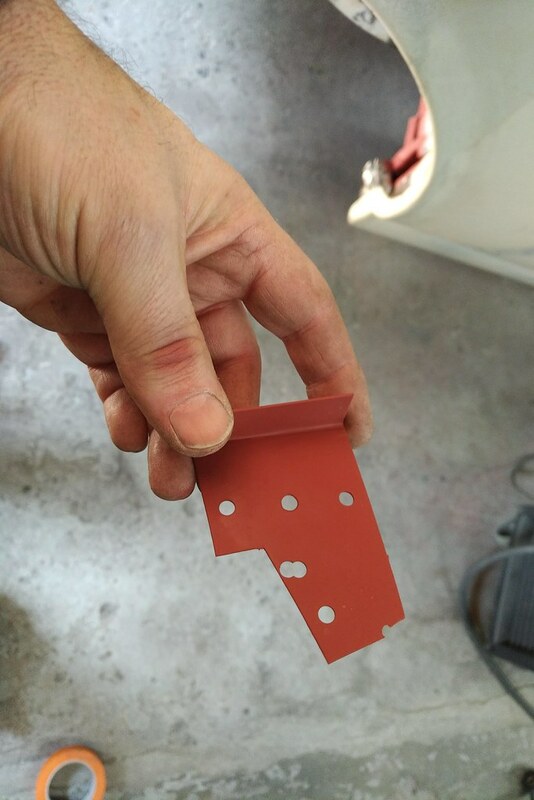 I didn't take pictures - it was just a little surface rust, that wasn't surface rust. The rear window leaked - that's the cause as far as I can tell. 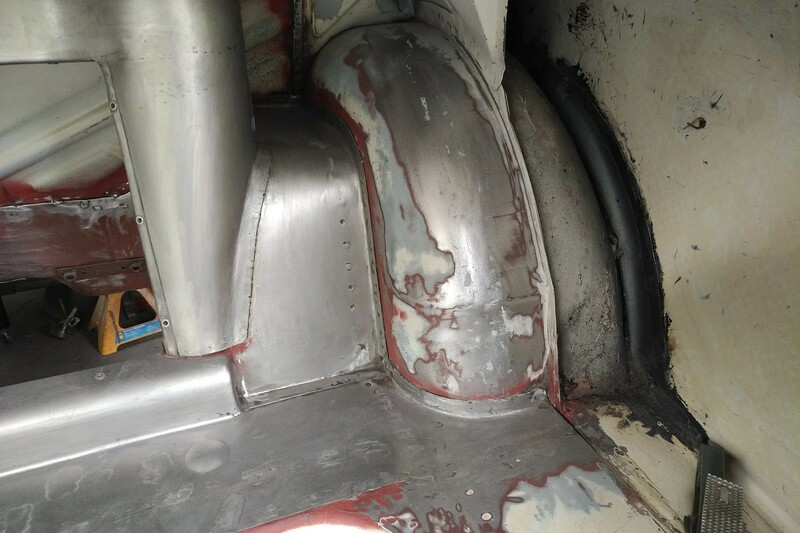 Wheel well rusts due to window leakage. 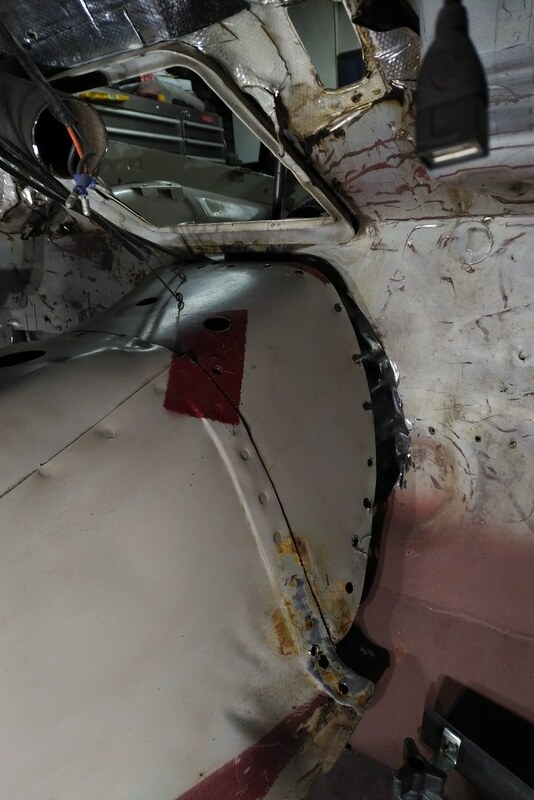 I'm not worrying about the doubling panel or the outer because I'm going to change this panel out when the fenders get done. Funny enough - this car is very solid on the inside. The old flanges just needed a little scrub and they're fine. Quick shot with some zinc weld through primer. Patch panel - messed up punching the one hole! 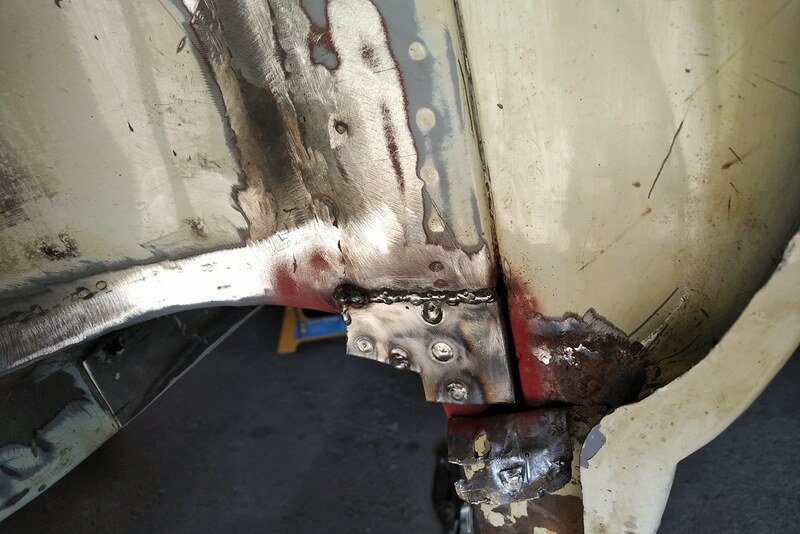 A few plug welds and a little seam and we're all fixed up. Grind it back to finish it off. 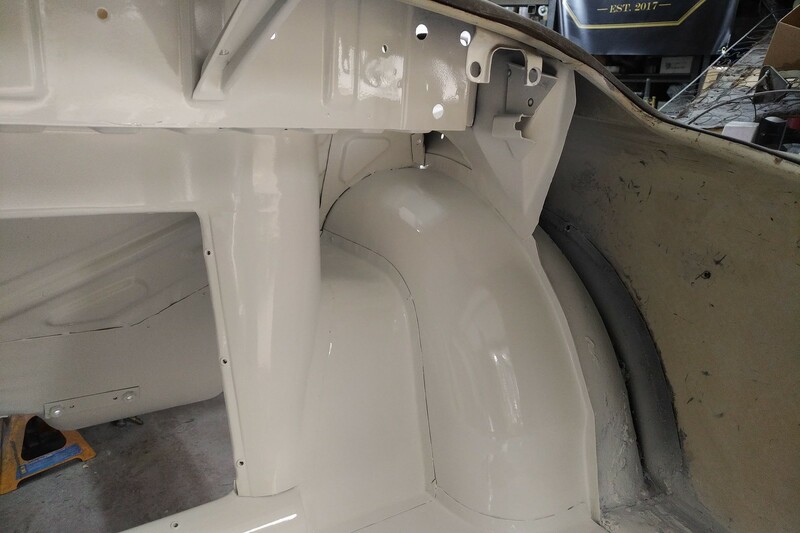 And a dab of primer. 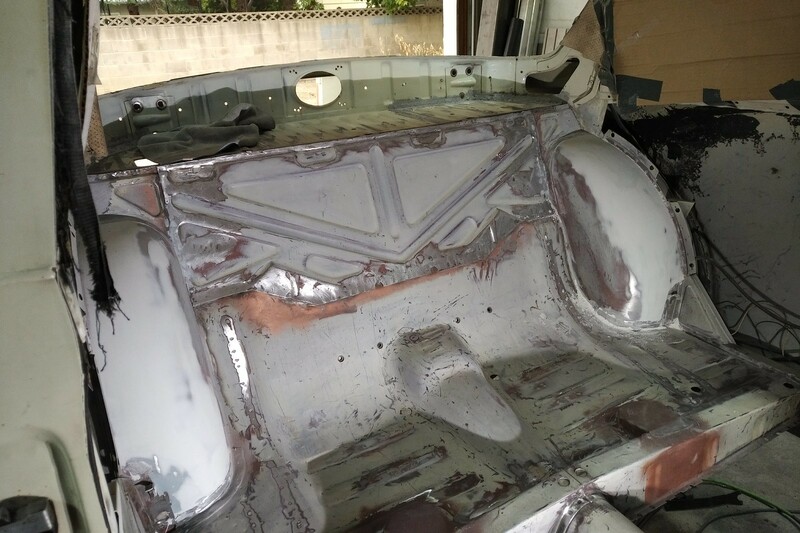 I'll be epoxy priming this area later. 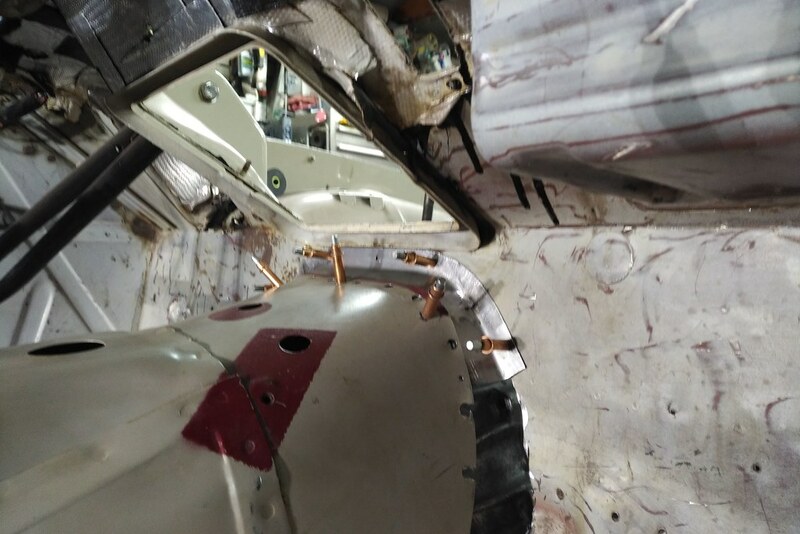 The zinc is there as there will be a closing panel when the new outer wheel well goes on. I'll just tape the are when doing the rest. Great work man, I'm taking notes so I can rebuild my front geometry and steering at some point in the future. 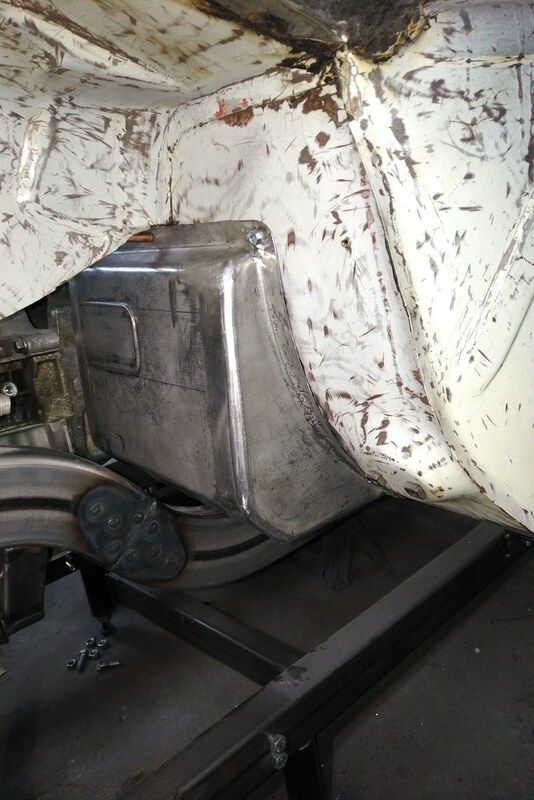 On the oil pan front, I cut a similar amount (maybe more) off of my sump and have had zero oil starvation or pressure loss issues. Mine isn't a race car by any means, but I've done some pretty decent cornering in the rockies with it. The dipstick is stock 960, and I can get right at 6 quarts in it going by the full mark on the stick (not including filter). I'm using soft rubber mounts too and I haven't had any rubbing issues, clearance is pretty tight in a couple of areas. 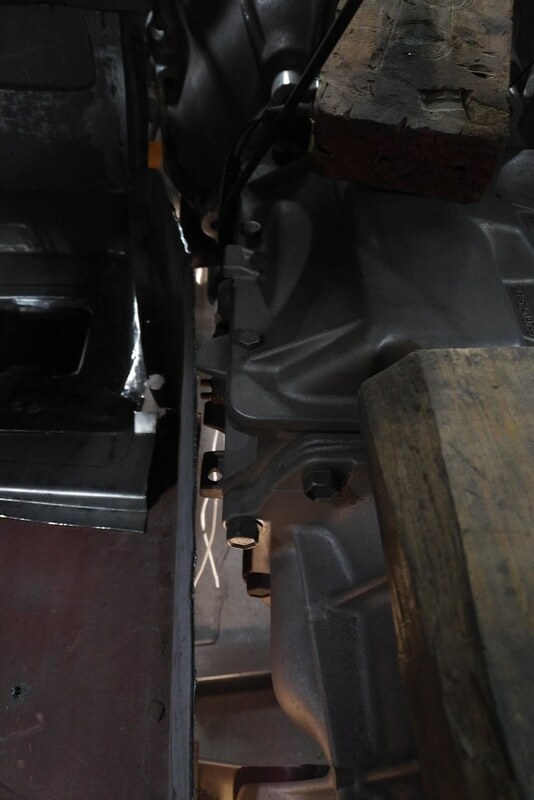 My engine is a PITA to remove too, I really need to notch the front cross member for sump clearance during install. The pan is just so big there's only one way to get it in there. Last edited by stick70; 08-14-2018 at 11:38 AM.. I'm trying to get caught up with my video backlog. I'm going to try to get a few shorter episodes out here in the next month to get caught up. 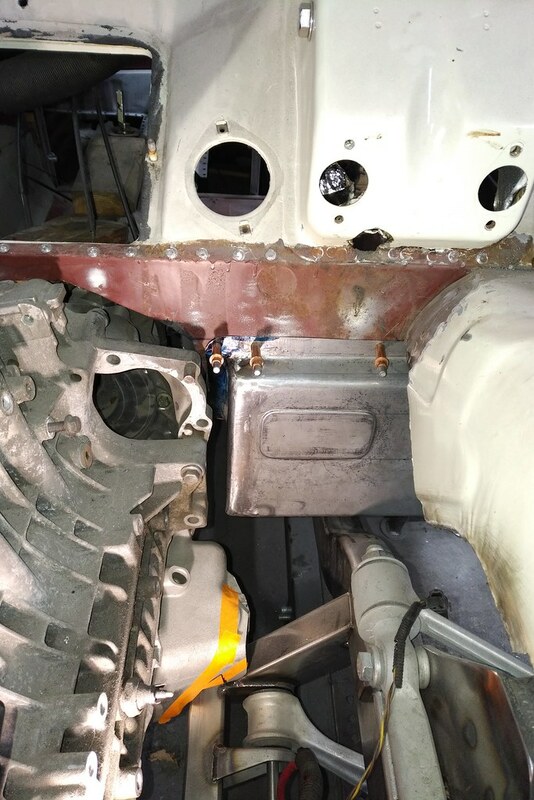 The start of the oil pan modifications. Still rocking and rolling right now. Absolutely loving the "Ride of the Valkyries" music......... what is the smell of victory in the Throttle Stop Garage? Also loving your fabricating..... I just may have to subscribe! LOL - thanks. You'll see what the traditions are when we finally roll this thing out of the garage. My wife and dog do not approve of most of the smells that emanate from the garage. Let's see if I can get 100 subscribers! 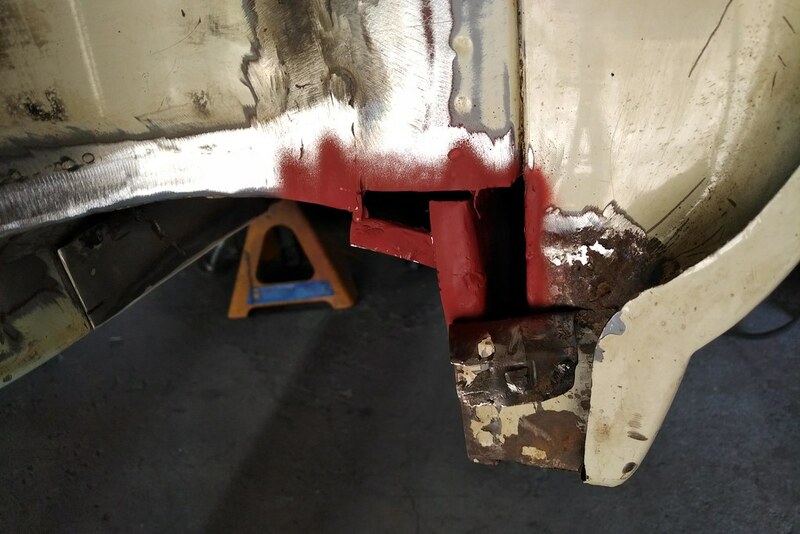 I sure can appreciate your challenges with this build...... optimize the suspension, then fighting for every bloody inch when fitting the whiteblock, what with the original 1950's suspension location in that classic sheet metal. 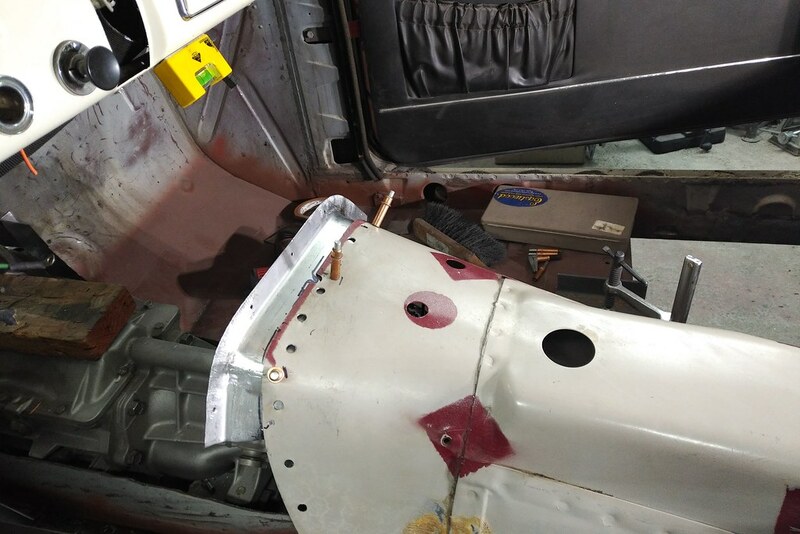 It certainly might have been easier to try and graft a 960 crossmember into the Amazon, but with minimal front suspension improvement. If it makes you feel any better, recently HOTROD ran a story about a guy fitting a full dressed LS into those confines..... however I doubt he went to your lengths on the Vette front suspension and steering (memory says they were dirt track building guys who just feel in love with the Amazon wagon metal). I'm pulling for you Craig, and very, very impressed with your fab skills. 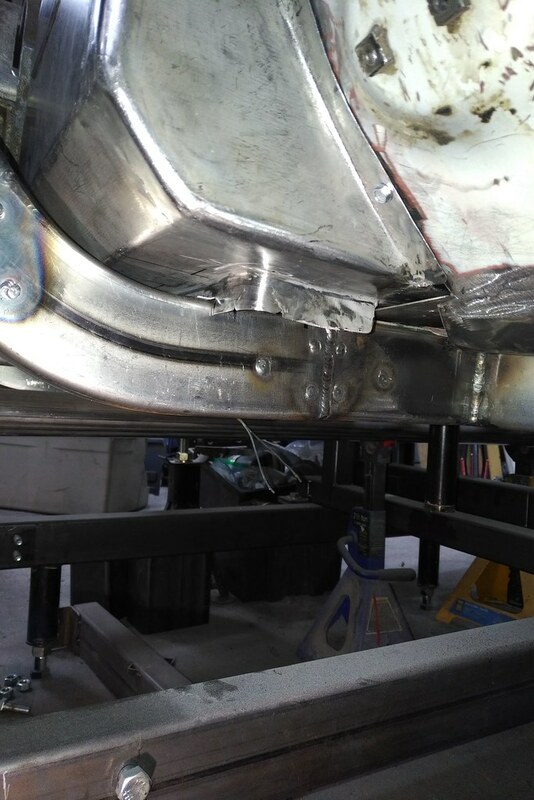 Now I'm heading downstairs to MIG together some 409SS exhaust, stretching my skills a bit further (using 309L wire and TRI-mix, so I've got that going for me). Here's the latest installment. I'll do up a post later for those that would rather that form of content. So - something is now DONE. This is a hell of a build, can you come do mine next! Thanks - trying to keep the details and quality very high. Still so much to come together before it starts to look like a car again. 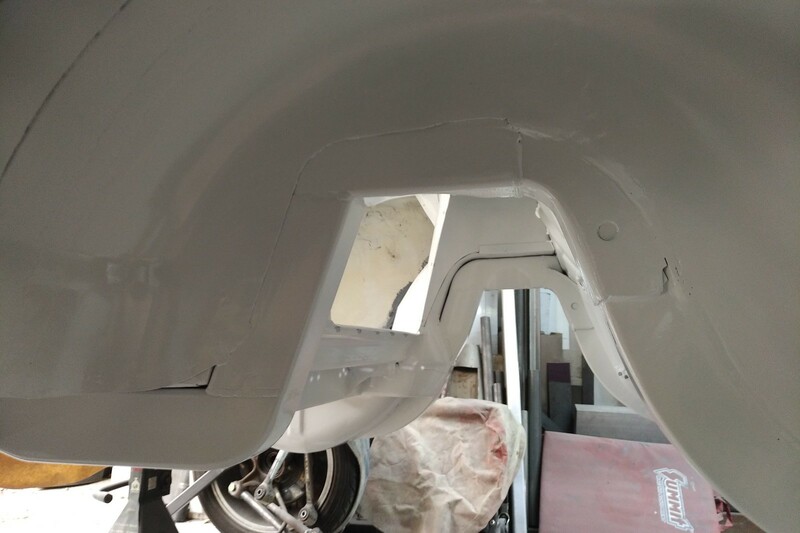 I get the rear sheet metal all finished, filled and primed. Yes, it's progress...you heard it hear first. I thought it was time to switch things up a little and actually completely finish something on this project. 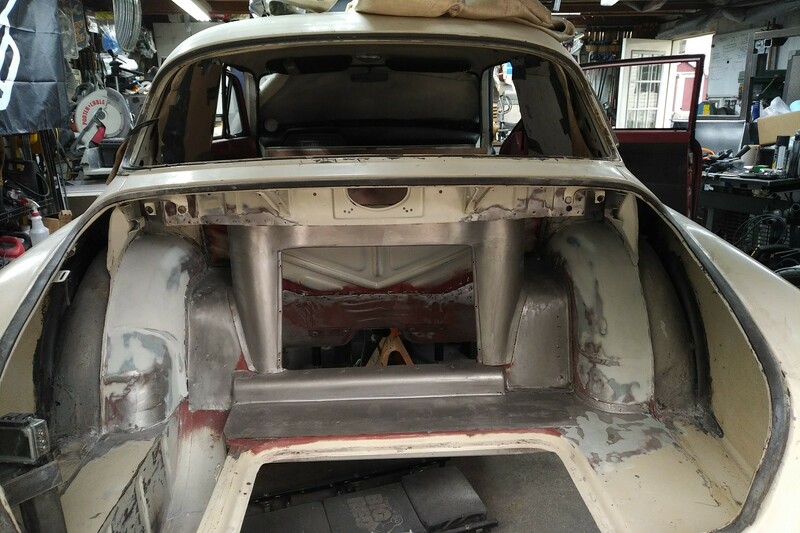 So the rear of the car, for years...has been close to finished. Close. But not finished. 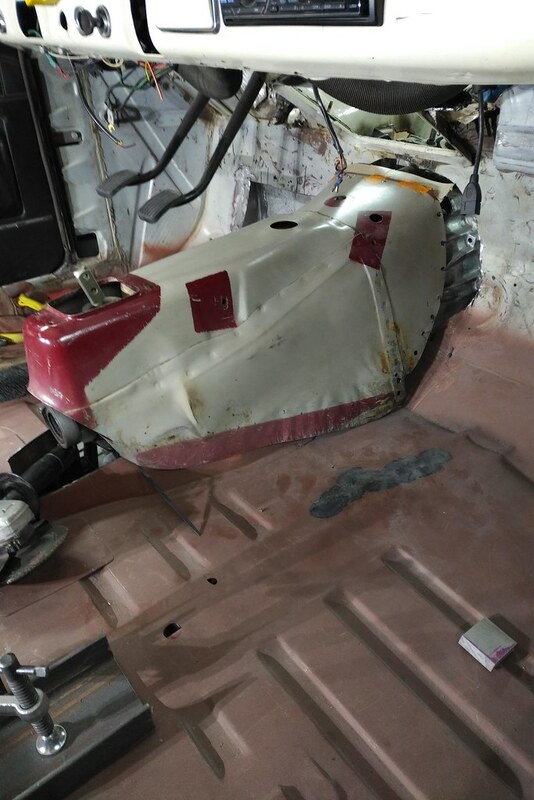 The sheet metal was roughly fitted and held in with Clecos and the rear seat bulkhead was out, but held in with Tek screws. 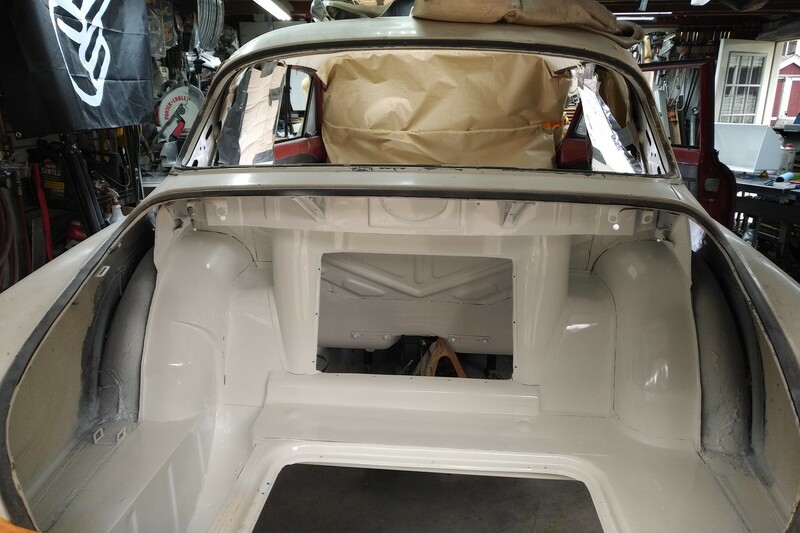 I have stretched the rear inner fenders 20 mm or so and re-crafted the original back seat back to fit (the base fit fine). 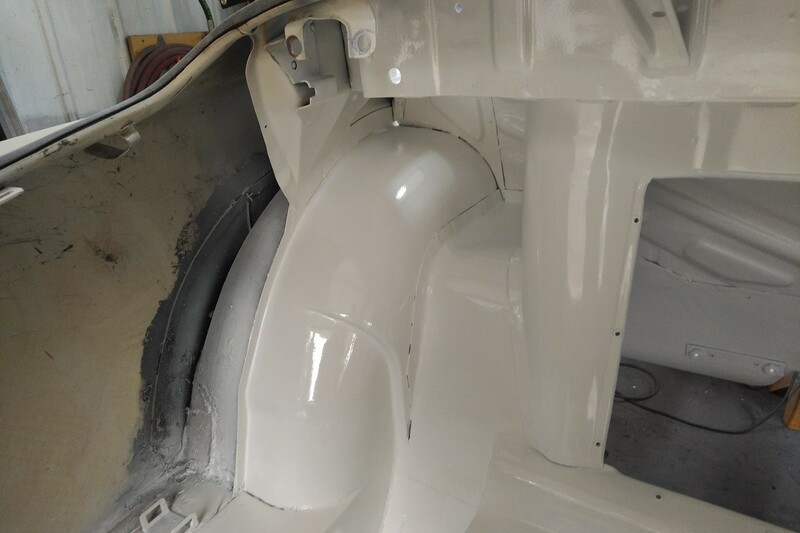 But I had never finished up - it needed some filler and the seam sealer was rough, and it was a little scratched up from having to remove the previous Dynamat installation. So I got to work (see the vids) and got this done. It took almost 3 weeks to complete. 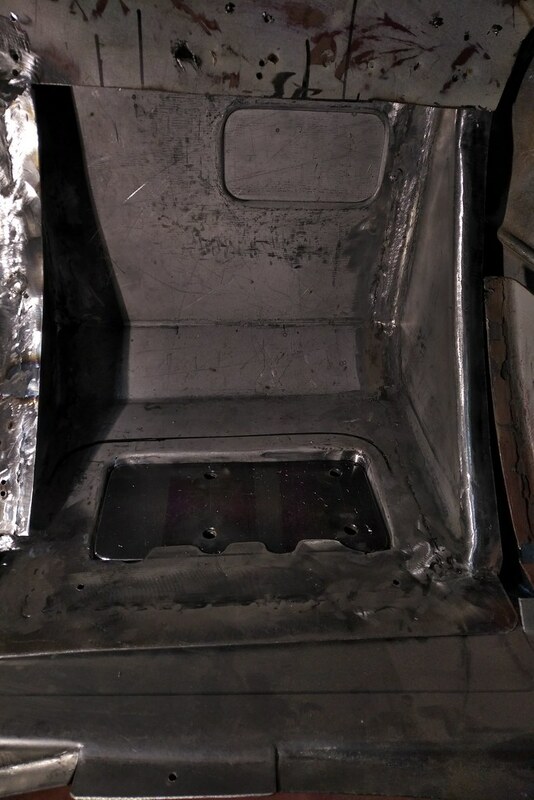 Here's the back seat bulkhead welded in. 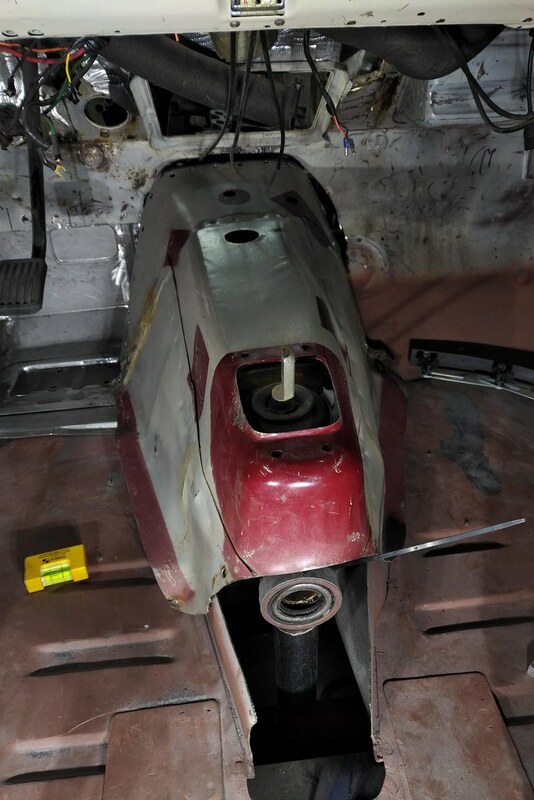 I had just slopped some epoxy primer on it a few years ago, so that had to get sanded off and this photo is mid prep for the rest. So some parts done, most not done. You can see where the strip was added...you can't feel where it was added. I then returned to the trunk to get that sorted out. 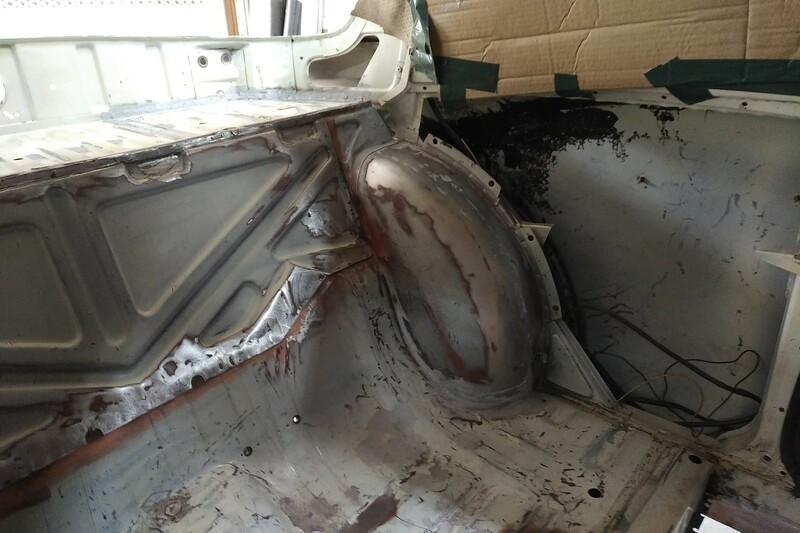 Lost of paint on the inside of future box sections and many, many plug welds later I was sanding and almost ready for some filler. Drivers side fender is a little artsy as I will be carrying a spare tire. 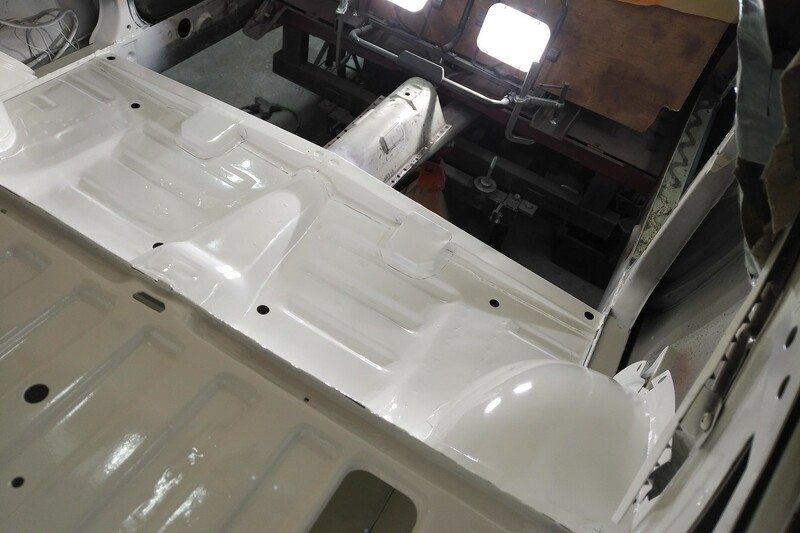 Inside and out were then filled with a short strand waterproof filler and finished with some very nice Evercoat Ultra. No pin holes, easy to sand. The perfect filler. 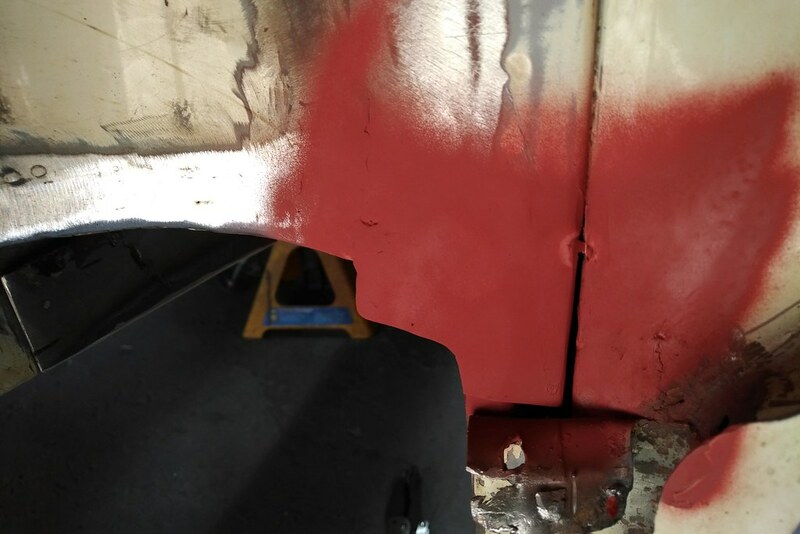 I then broke out the paint guns (I like painting) and treated the metal to two coats of PPG Epoxy Primer (DP48LV) - don't use cheap epoxy - it's nothing like the real deal. Note, I filled the old speaker hole in the parcel shelf area. I think it came out great. Getting in all the nooks and crannies was a challenge...thank goodness for fan control. Ya, that'll do. 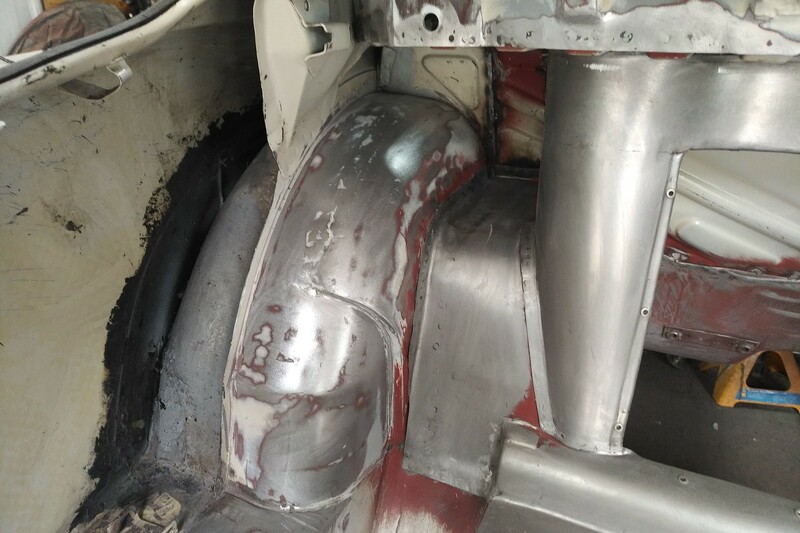 I still have to change the outer wheel housing - so that's why that's not painted. I also did the complete rear underside - so that's all done. 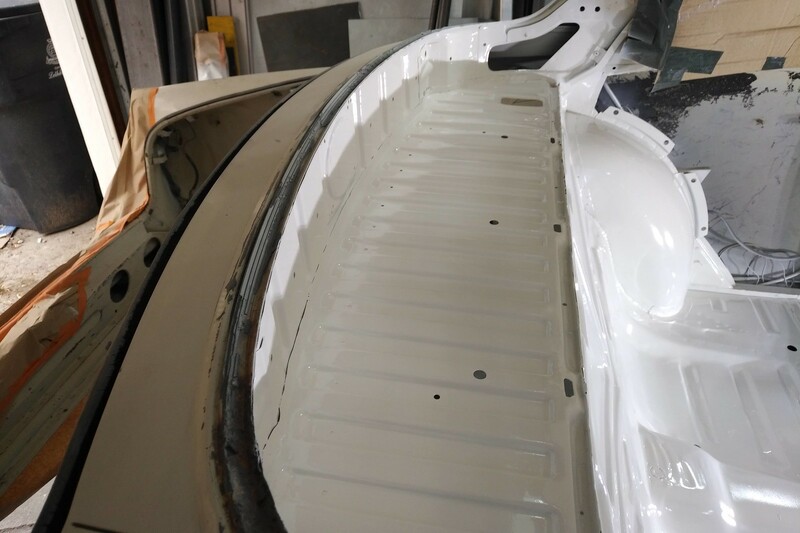 It needs seam sealer, but that can wait until we're laying colour and done the rest of the sheet metal work back here. For now, the IRS is back up at home and we're moving onto the front of the car again. I've been a bit busy with work...and we added a new member to the team. 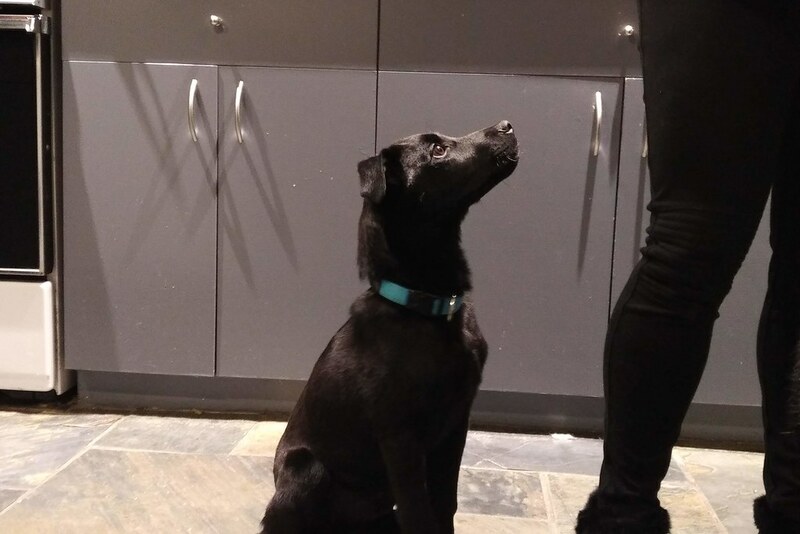 He doesn't like the garage a lot just yet, but I have hopes. So with the back finished enough for now, it's back to the front of the car. 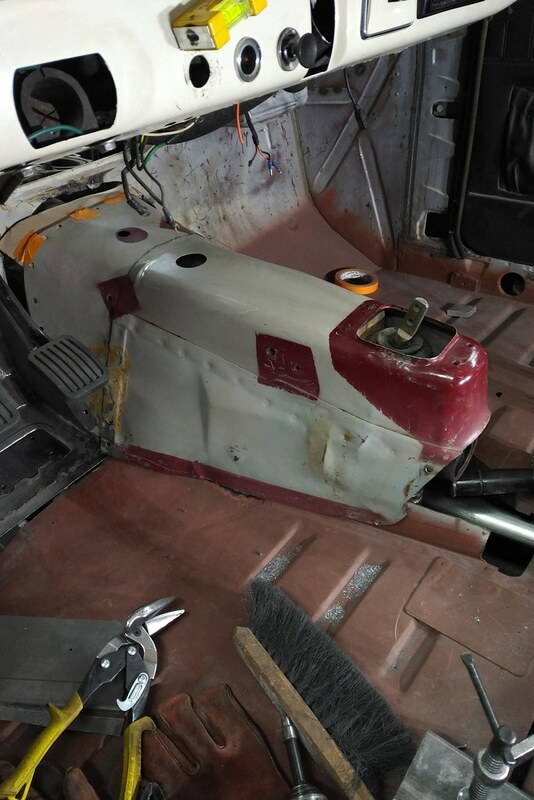 Before the frame can go in, the pedal box for the floor mounted pedals needs to go in and the transmission tunnel needs to be replaced. So let's get on with the show. 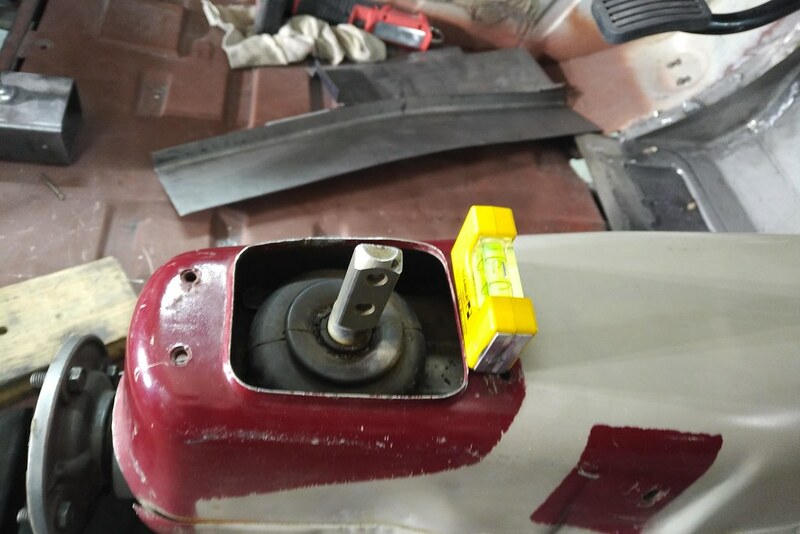 The engine position meant the pedal box needed to move towards the outside of the car about 1/2" No big deal, I had the room. Just a little more metal massaging. Final position - seems fine. 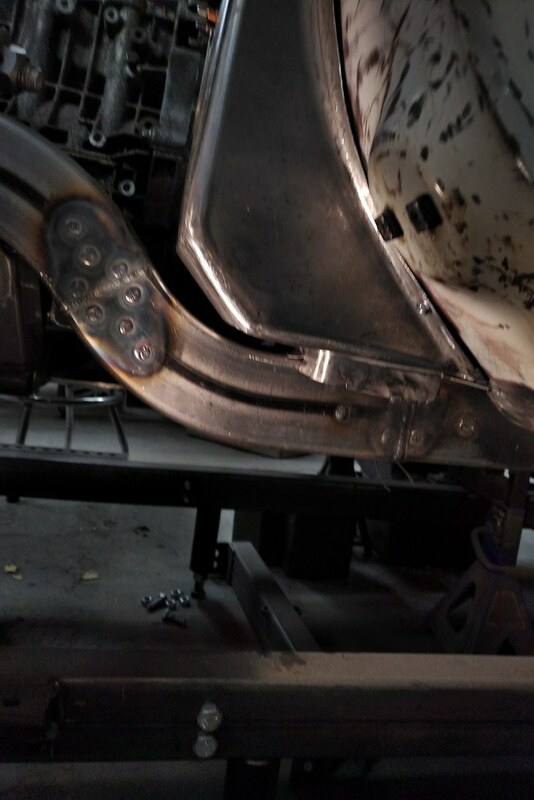 The pedal mount plate welds directly to the frame - it's 1/8" plate and should be more than enough once fully boxed. I had to create a relief in the box to cover a gap between the box and the frame - the box ended up going a little higher on the firewall than planned, so this was easiest. I'll fill in the sides and front so that crap doesn't collect in the gap. I'm also working on the transmission tunnel. It's a bit tight on the drivers side...reverse switch is on the sheet metal. I think I'll just bend it out a little...this should do the trick. 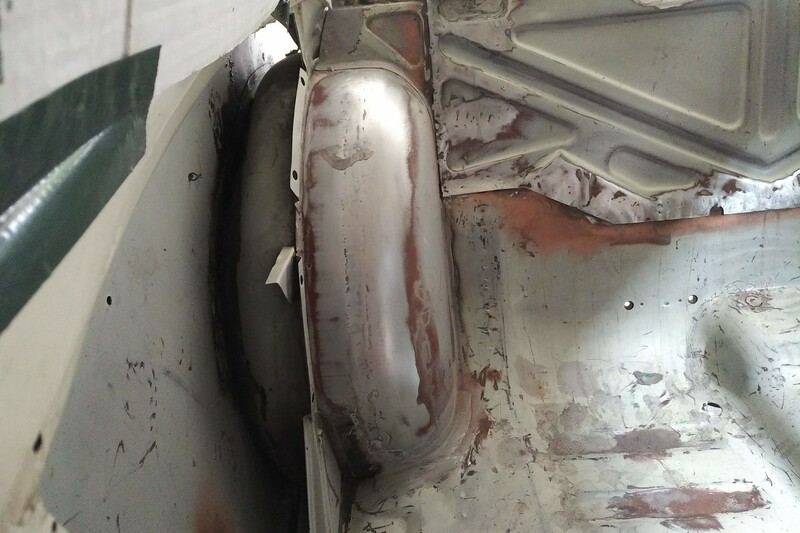 240 tunnel all cleaned up - looks like a good fit once the front panel was removed. I should get the sheet metal flange built to receive the trans tunnel this week. Then mount up the rear end and see what I have to do for the drive shaft tunnel. dat paint work... Excellent updates as always. Time to get the trans tunnel sorted out. The 240 tunnel will work almost perfectly. 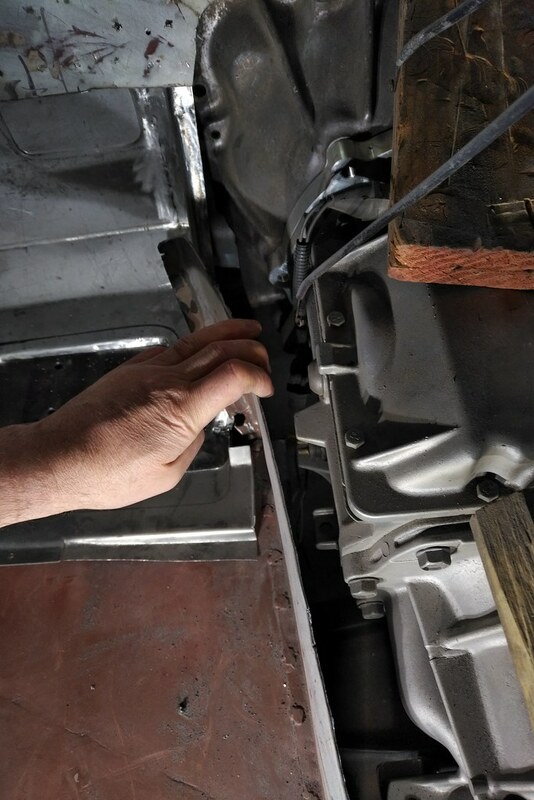 I was amazed when I knocked out the lip where I lopped this off the donor car that was just about perfect. I toyed with the idea of reusing the base of the old tunnel, but it just didn't make any sense to do that when I still had to build the flange to attach this tunnel to the firewall. It really isn't the right shape to match at the base, so better do it right. Didn't take any picture of how I did this...watch the video when it's out. Here's the top joining part. Getting it all levelled off was tricky - but worked. Took two stabs to get the shifter dead centre. Then the skirting got done. This will get tidied up and finished this week. 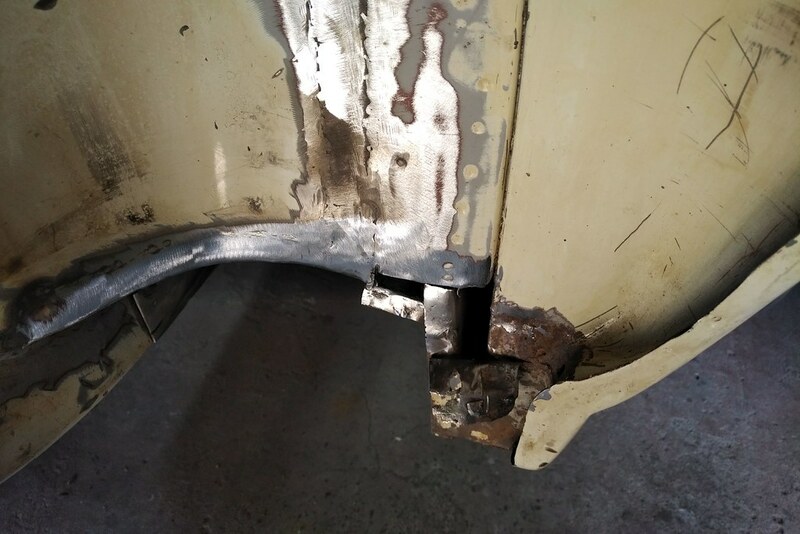 Then the tunnel is a little closer - next up will be the drive shaft fitting. Very nice! Love seeing the progress!